Materials can be produced in-house, subcontracted, or procured externally. Data for these materials is located in the logistics components PP, PP-PI, and MM. This data is accessed when the materials are costed. Product cost estimates can also be used for inventory valuation and for comparison purposes in Cost Object Controlling. Training: A product training session at customer premises n Intangible goods are introduced in this course using the example of base object costing. Similar costing methods are provided for services in the form of a cost estimate without a quantity structure. What is the amount of the cost of goods manufactured and the cost of goods sold? Can we justify production at this market price? What is my lower price limit? From a cost accounting point of view, is it cheaper to produce in large or small lot sizes? How are the costs broken down? For example, how do the material costs compare to the wages? How could the production process be improved? Which organizational unit affects the product costs the most? In which plant can the product be manufactured the cheapest? What effect have machine depreciation and energy costs had on my product (primary costs)? Without a large master data input. During the product design and specification phase, the costs increase when refinements are made to the original specifications.After the transition to the prototype stage, the first constructive data can be entered in the form of BOMs. During this phase, the need for integration and for direct access to the data in Logistics increases. Data not available in Logistics is added by the person responsible for product cost planning. Once the products have reached market maturity, the integration of master data for tangible goods has a significant impact. At this stage, the complete product range is costed regularly, and precise cost shifts are monitored.Improvements in the production process of important products must be reflected by, and analyzed in, Product Cost Planning. When a cost estimate with quantity structure is created, the system uses master data from Logistics.This method costs individual products exactly, and provides various analysis options for comparing different alternatives.Costing runs are used for processing mass data. They are used periodically to cost the entire product spectrum.One of the focal points of this course is integration. Functions are introduced gradually. Consequently, the course materials are not designed to be used as a reference work. 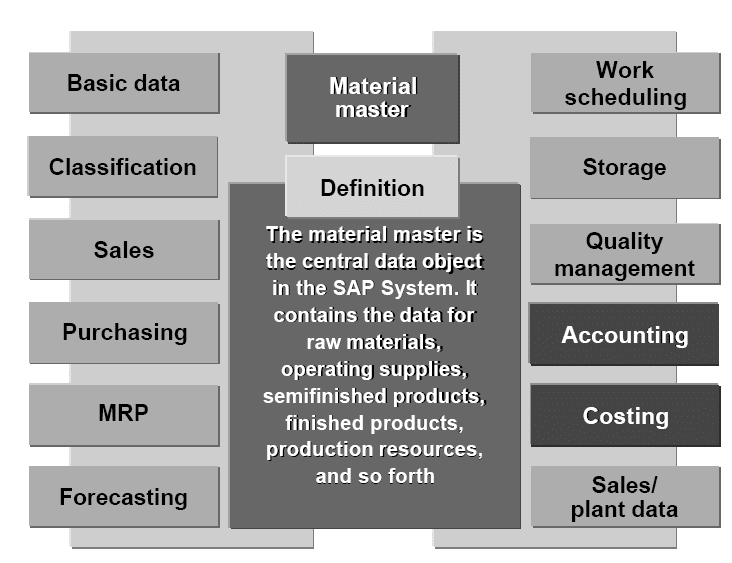 For a comprehensive reference work, refer to the SAP Library under Product Cost Planning. Material cost estimates are saved with reference to a plant.Products produced in more than one plant have a separate cost estimate for each plant.To valuate material movements in Logistics, the system accesses the costing results. The valuation area determines the organizational level at which the material is valuated. To utilize material costing, therefore, it is mandatory that each plant is established as the valuation area. 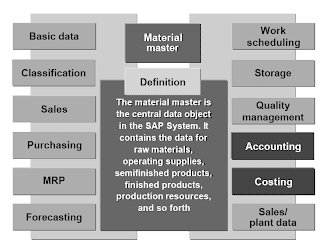 Synonyms for the term material master are material, item master, product, and assembly.In costing, the material master is involved in the calculation of material costs and in updating prices. n The Accounting, Costing, and MRP views are relevant to costing. Costing view:Containsthe control parameters for material costing. Also contains characteristics required for Cost Object Controlling.To be able to cost a material, the Costing view must be maintained. The material type determines whether a costing view is allowed for a material. It contains default values that are used when a material is created.Lot size . The lot size entered here is used as the default value for the material cost estimate. In individual processing, the lot size can be overwritten. In mass processing, it cannot be overwritten. Overhead group: Key that groups the materials being manufactured for the same type of overhead application, depending on the product in question. Planned Prices 1, 2 and 3. These can be maintained for raw materials and purchased parts, and used to valuate the materials in the cost estimate.Tax-based and commercial prices. These prices are entered for purchased parts in inventory costing for values such as the determination of lowest value. An inventory cost estimate can use these prices for valuation, and then update the costing results for finished and semi-finished products in these fields. A standard cost estimate can be used to update the standard price. You can branch from the accounting and costing views to the results of standard cost estimates. These results update the standard price. The value added of the material (upper level). The costs of the subordinate materials (lower level). Up to 40 cost fields can be rolled up in a cost component split. A cost component can carry fixed and variable costs. A cost component view consists of a combination of cost components according to various characteristics.It creates a filter in the Information System reports so that only data assigned to the view is displayed. In the cost estimate header, you can display up to 5 views as the initital costing result. You assign these views under the Settings menu in the cost estimate header. What is the proportion of costs attributable to technical and organizational improvements? Example: Use of current quantity structure and valuation at historical prices.Subsequent comparison with standard cost estimate. What is the influence of changed raw material prices and potential wage increases? Example: Use of historical quantity structure and valuation with current or future prices.Subsequent comparison with standard cost estimate. How are the current costs broken down? Example: Current quantity structure with current prices. Example: Maintaining and valuating make-or-buy acceptances, prices, quantities and structures under a separate version.